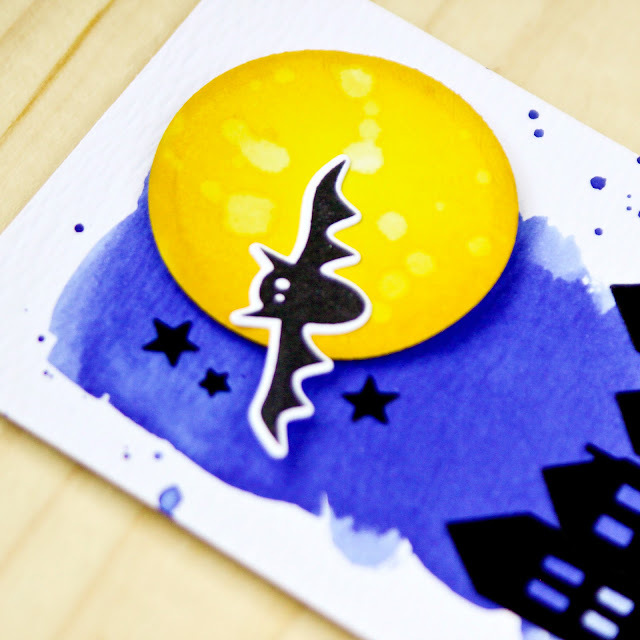 i've been seeing a few distress ink "moons" around and i couldn't resist creating one myself! it was so easy and fun. -i started with a 3.5 x 5 sheet of watercolor paper and using blueprint sketch distress ink, i watercolored a loose background. -i stamped the cute little bat from the essentials by ellen clear stamps got candy? set with versafine onyx black and then die cut with the coordinating set. -then i did all the rest on my die cutting, a circle from the lawn fawn circle stackables out of solar white. 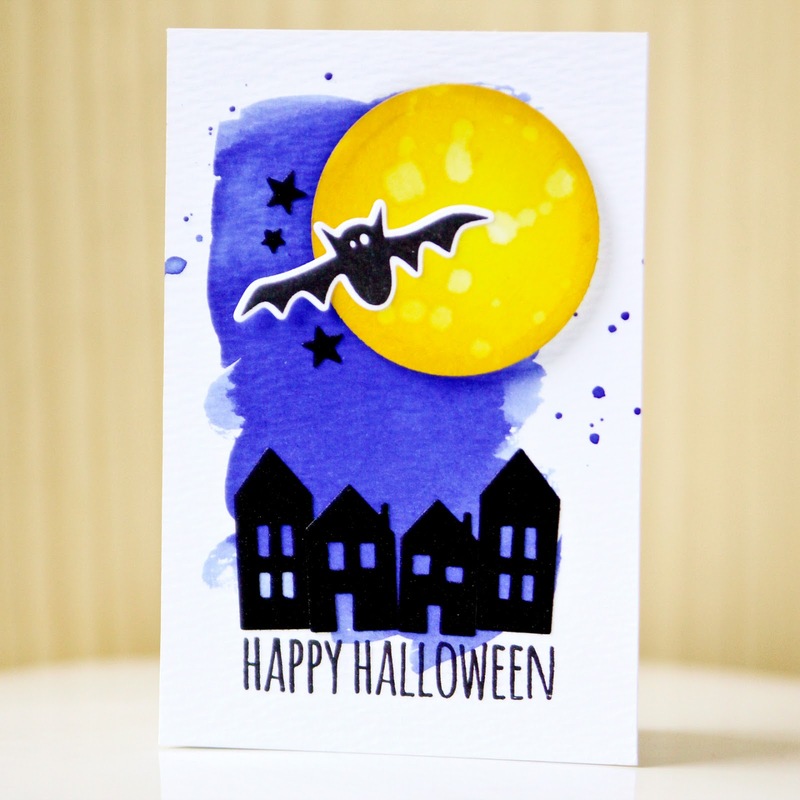 and with the essentials by ellen designer dies home & hearth, little houses and stars from black glitter paper. -on the solar white circle i used an ink blending tool to combine two shades of distress ink, squeezed lemonade and mustard seed. once i was happy with my "moon" color, i used a paint brush with clean water to drop water onto the circle to create my "crater". 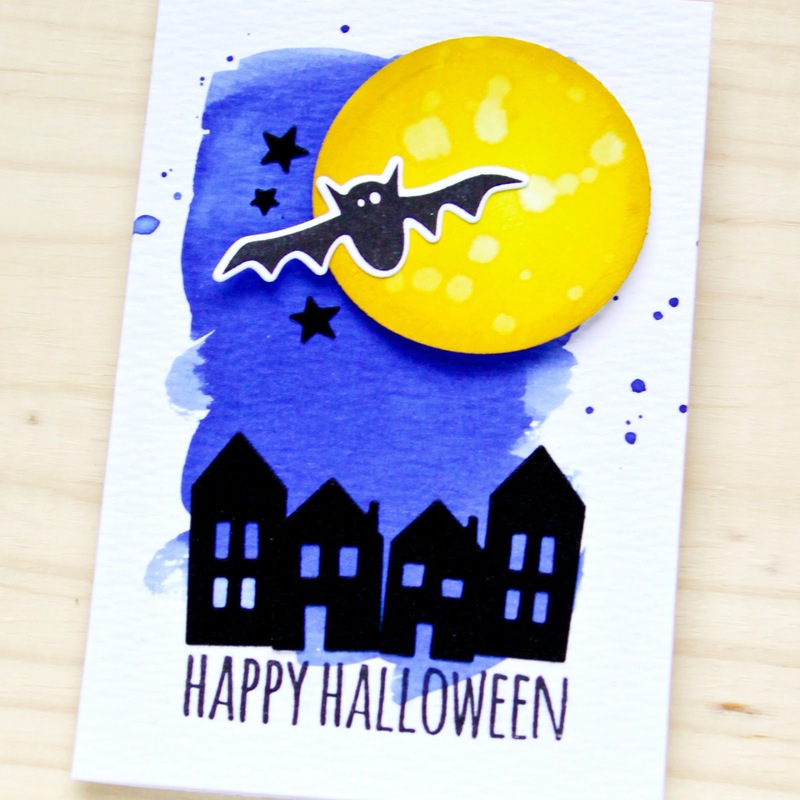 -i stamped the "happy halloween" from the essentials by ellen clear stamps got candy? set at the bottom of my watercolored background. then i started to adhere my pieces, beginning with my spooky glitter houses. then i adhered the bat to the moon and 3d mounted the moon to the card. i finished with the little stars. -and i adhered the whole 3.5 x 5 watercolor panel to a 3.5 x 5 solar white card. This is soo much fun!!!! Love the vivid colors!